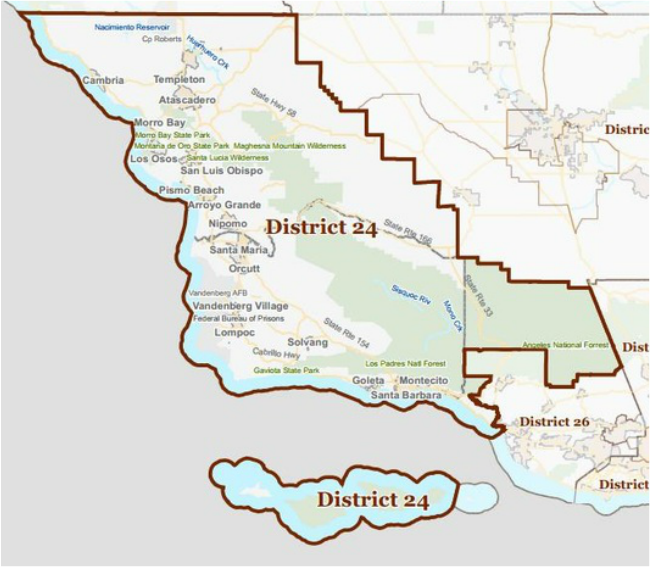 Democrat Lois Capps currently represents Congressional District 24. Capps has announced that she will not seek re-election in 2016 creating an open seat. Due to a close split in voter registration, it is possible that this seat can be competitive with a well funded Republican challenger. Congresswoman Lois Capps has been a resident of Santa Barbara, California since 1963 and represents the state’s beautiful Central Coast, which includes the entirety of San Luis Obispo and Santa Barbara Counties, and a portion of Ventura County. She was sworn in as a Member of the 105th Congress on March 17, 1998, succeeding her late husband, former University of California, Santa Barbara professor, Congressman Walter H. Capps. Congresswoman Capps is committed to helping people improve their daily lives through better schools, quality health care, and a cleaner environment. She is a respected and effective leader in Congress, especially on issues related to public health. Mrs. Capps has successfully spearheaded and passed legislation specifically to: address the national nursing shortage, detect and prevent domestic violence against women, curb underage drinking, improve mental health services, provide emergency defibrillators to local communities, bring CPR instruction to schools, and improve Medicare coverage for patients suffering from Lou Gehrig’s disease. Mrs. Capps has also been at the forefront of efforts to protect the environment. She has led efforts to prevent new oil and gas drilling off our coast and on the public’s lands and protect consumers from shouldering the financial burden of cleaning up water pollution in their water supplies. Mrs. Capps serves on the powerful Committee on Energy and Commerce. She sits on the Health, Energy & Power, and Environment & the Economy subcommittees. From these posts, Capps focuses on Medicare reform, the nursing shortage, cancer, mental health, energy policy, and the protection of our air and water. Mrs. Capps’ extensive healthcare background informs her work in Congress; she founded and serves as the co-chair of the House Nursing Caucus. She also serves as co-chair of the Congressional Heart and Stroke Coalition, the House Cancer Caucus, the Congressional School Health and Safety Caucus, National Marine Sanctuary Caucus, and the Sustainable Energy and Environment Coalition. Mrs. Capps is also honorary Vice-Chair of the LGBT Equality Caucus. During her 20-year tenure as a nurse and public health advocate for the Santa Barbara School District, thousands of Santa Barbara’s children and families benefited from Capps’ personal care and leadership. Mrs. Capps founded and served as the director of Santa Barbara County’s Teenage Pregnancy and Parenting Project and the Parent and Child Enrichment Center. There she gave countless young parents the support and encouragement to stay in school while providing them with critical child development skills to ensure their children grow up in healthy, loving environments. Capps also taught for 10 years as a part-time instructor of Early Childhood Education at Santa Barbara City College. Mrs. Capps graduated from Pacific Lutheran University in Tacoma, Washington with a B.S. in Nursing with honors and worked as a nursing instructor in Portland, Oregon. Capps also earned an M.A. in Religion from Yale University while working as Head Nurse at Yale New Haven Hospital. She also earned an M.A. in Education from the University of California, Santa Barbara. She has received honorary doctorates from Pacific Lutheran University and Pacific Lutheran Theological Seminary. Mrs. Capps has been an active member of Grace Lutheran Church in Santa Barbara, CA since 1964. Her father was a Lutheran minister and she was born and raised in Ladysmith, Wisconsin. Mrs. Capps was married to Walter Capps for 37 years and together they raised their three children in Santa Barbara, California. Her immediate family includes: daughter Laura, her husband Bill, their son Oscar; son Todd, and his son Aden; daughter Lisa, who passed away February of 2000; Lisa's husband, Nathan, their sons David and Walter, and Nathan’s wife Caitlin, and their children Mary, Ellen, Sarah and Anna.